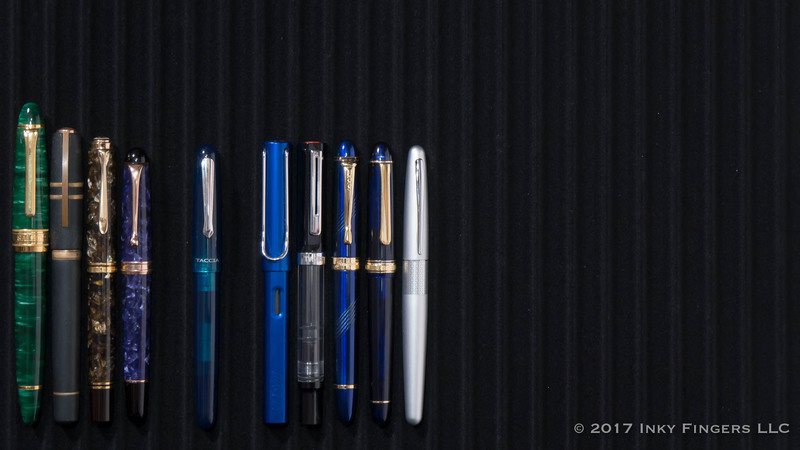 As I approach my fifth year of doing fountain pen video reviews on YouTube and written reviews here on the Pen Habit blog, I’ve been reflecting a bit on how my personal preferences for fountain pens have changed over that time. In many ways, I miss the newness and enthusiasm of early pen hobby-dom. I miss the expectation of a new, unique experience. I even miss the uncertainty of not knowing what to expect from a new pen. Hundreds of pens have passed through my hands, and I’ve started to develop a sense of what a pen will be like before I’ve even picked it up or seen it in person the first time. Those admitted preconceptions have sapped a little bit of the enjoyment out of the hobby. A big part of my preconception for new pens is centered around the nib. 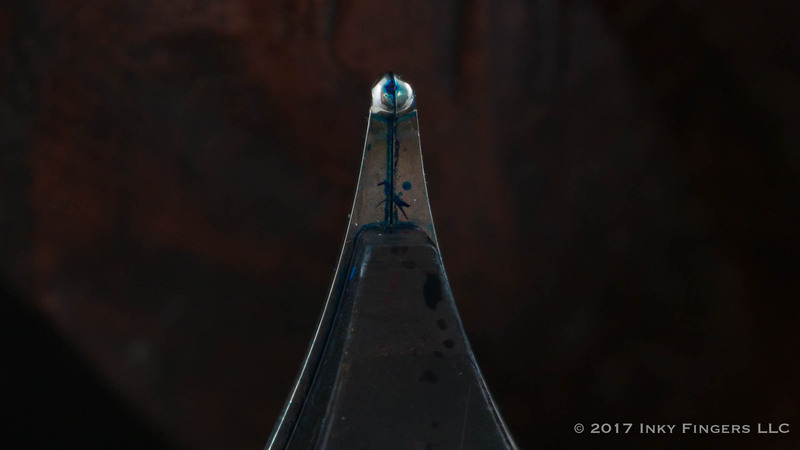 In the modern day of fountain pens, so few manufacturers make their own nibs, and there are so few third-party nib manufacturers, that you can almost take it for granted that you’re going to get a pen with a Bock or Jowo-made nib. And a disturbingly high percentage of manufacturers don’t seem to customize, adjust, or even check the nibs before screwing them into the pen body and shipping them out. 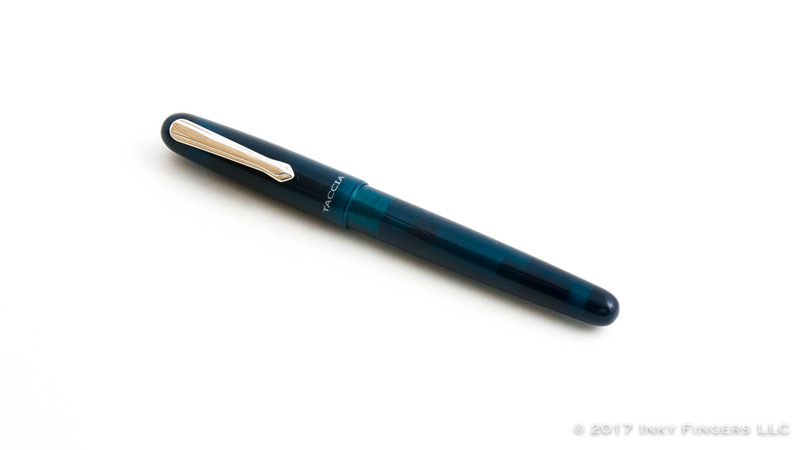 I’ve lost track of the number of times I’ve said in reviews, “If you’ve used a pen with a ______ (insert Bock or Jowo here) nib before, you’ve got a good idea of how this pen will write. 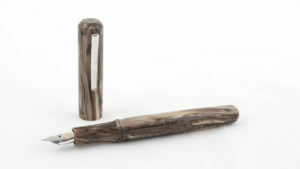 So, when a pen comes onto the market with a writing experience that is a little different, I tend to pay attention. 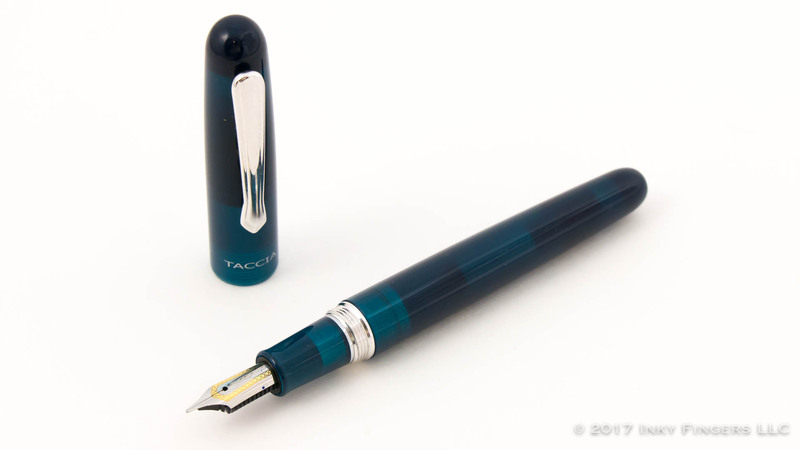 And it was the nib, more than anything else, that made me decide to take a look at the Taccia (I’ve heard it pronounced as “tasha”) Spectrum. Taccia is a smaller brand by Japanese fashion designer Shu-jen Lin that was founded in 2003. 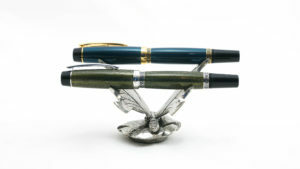 Perusing the brand’s website, you can see that they have a bit of a split personality: several of the brand’s pens are quite expensive, and feature popular Japanese decoration techniques like Urushi lacquer or Maki-e. I’ve never had a chance to review any of the brand’s high-end offerings; however, there are also more utilitarian, production model pens, like the Taccia Spectrum, or a pen that I reviewed a couple of years ago, the Taccia Covenant. 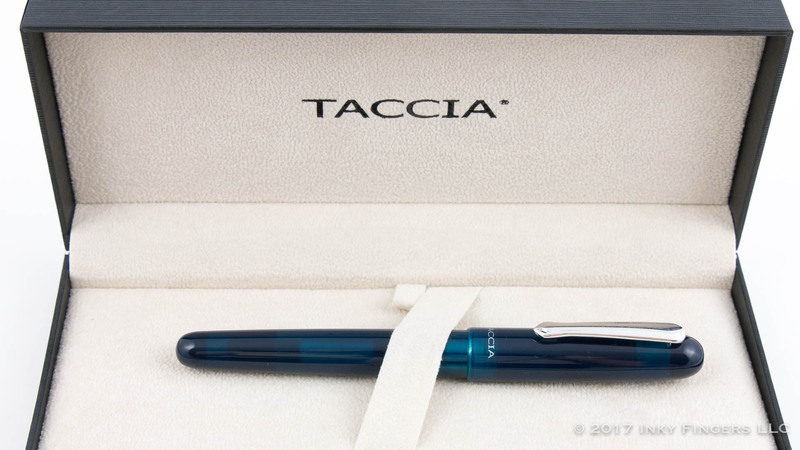 Taccia is distributed by Itoya, the same company that distributes the Sailor brand of pens and inks. 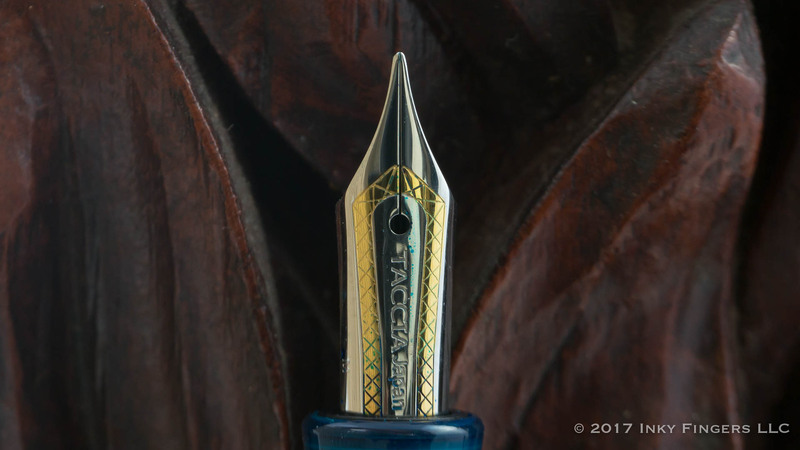 And likely due to this shared distributor, Taccia has managed to get ahold of Sailor’s celebrated nibs to include in the Spectrum. This makes the Taccia Spectrum something of an outlier in its price range. 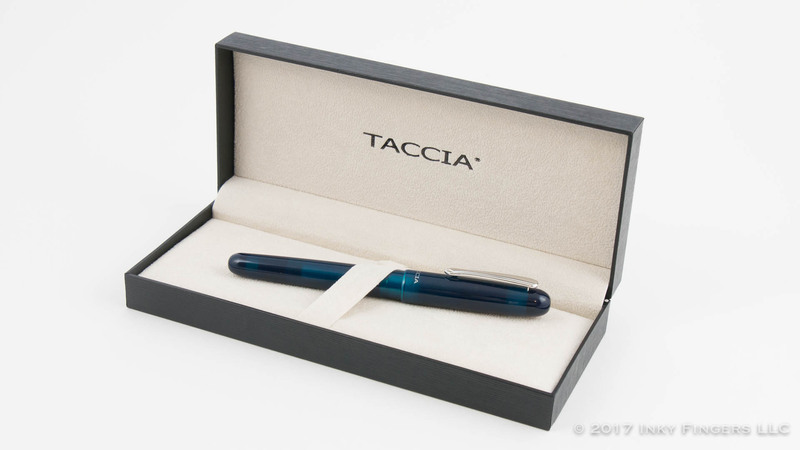 In typical Japanese fashion for pens in the daily writer/workhorse price range, the Taccia Spectrum features a relatively standard profile. 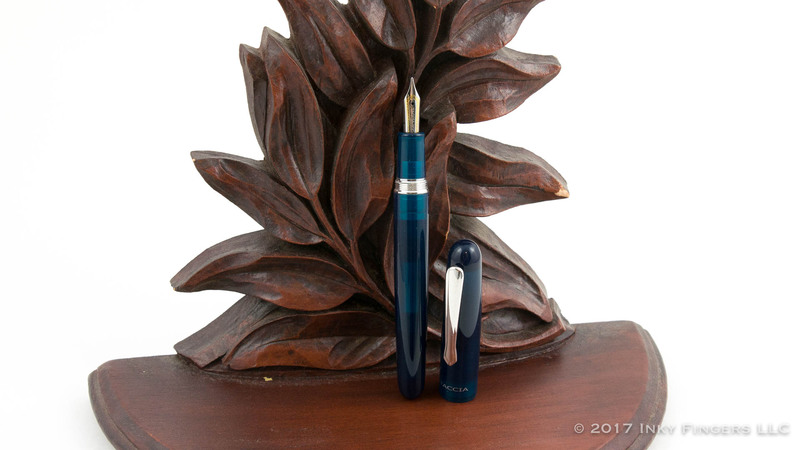 The pen’s cigar shape will not win any awards for innovation, certainly, but it’s a nice, proportional shape that anyone who has spent time with fountain pens will recognize. What does set the Spectrum apart from many of its countrypen is the material from which it is made. Rather than being an understated black, burgundy, or some other equally boring solid color, the Taccia Spectrum comes in three semi-translucent acrylics: merlot red, ocean blue, and what they call forest green (which is actually more of a deep teal). I opted for the forest green, as I don’t have many pens of this color in my collection. It’s a nice material. I can’t tell if the pen is injection molded or lathe-machined, but based on the pen’s price point, I’m guessing the parts are injection molded. In either case, the finishing of the pen is wonderful. It is beautifully polished, the tolerances are tight, there are no machining or mold line marks. It is an extremely well-made writing instrument. The cap features a stiff clip with a sort of upside-down necktie design, which is attached to the cap through a slit in the cap wall. 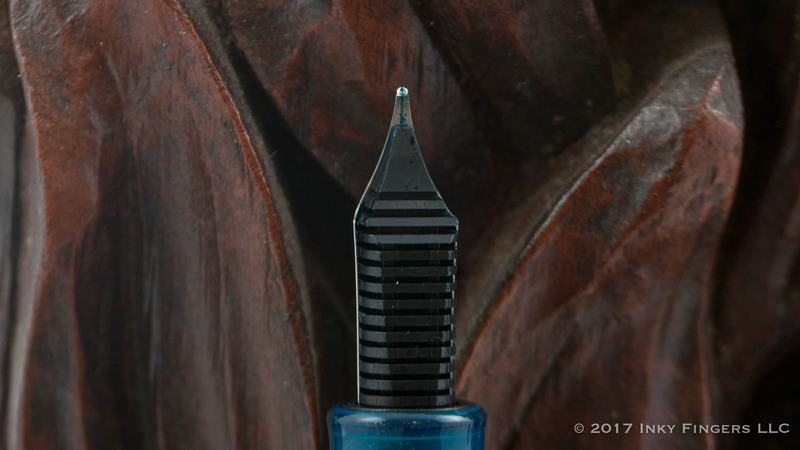 The cap takes nearly three full turns to remove from the barrel and features an opaque cap liner to help keep the nib from drying out. (It does, unfortunately, obscure the nib from view when the pen is capped, however.) Right near the lip of the cap is a small, printed Taccia name. There is no cap band or any other decoration at all on the cap. The barrel is even less decorated than the cap. There are no markings of any kind. 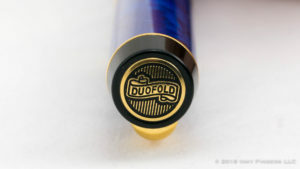 The barrel tapers to a blunt, rounded end typical of the cigar pen shape. Under the cap is where things start to get a lot more interesting. The cap, which is acrylic, meshes with metal threads on the barrel. There is a metal collar that connects the barrel and the section together (which you can see through the translucency of the material). The section itself tapers and has a slight lip right toward the nib end. It’s a short section, and a bit too narrow for my personal taste, but not so much so that it makes the pen uncomfortable to use. Because this pen features a Sailor nib (more on that in just a moment), it also features a Sailor cartridge/converter filling system. Now, my distaste of Sailor’s converters has been well-documented and oft-repeated, but I’ll repeat it once more in the admitted-vain hope that someone at Sailor will pay attention and fix an aggregious flaw in their manufacturing chain. Sailor makes, without question, the worst converters on the market. I’ve had SO MANY Sailor converters fail on me that I keep a stash of 5-10 of them in my pen box at all times. They have a deeply unfortunate tendency to leak behind the piston and out the rear end of the converter. And as I recently experienced through a bout of severe food poisoning, rear end leakage is not a problem anyone wants to deal with in any form. For a company that makes such wonderful pens, feeds, and nibs, I am continuously boggled as to why Sailor’s engineers haven’t managed to figure out a better converter system. Sailor, please. For the love of all that is good and holy. STOP THE INSANITY. 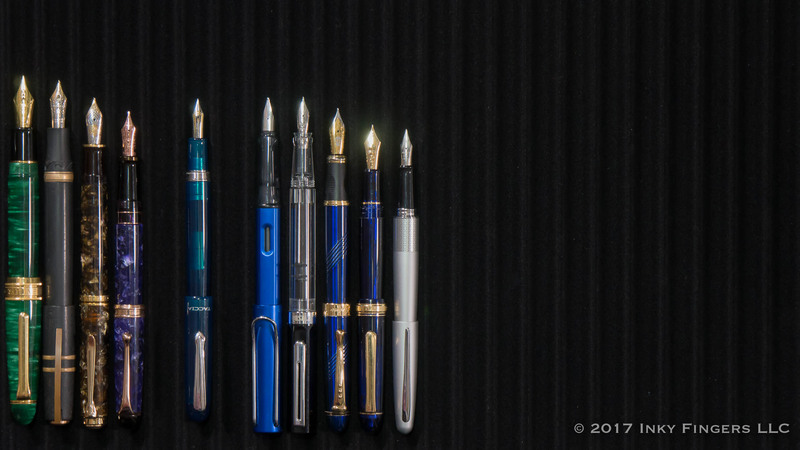 Then, at last, we come to the Sailor-made nib. Sailor’s nibs are, rightfully, considered some of the best nibs in the industry. They make their nibs in-house, and they employ some of the very best nibmeisters in the world to adjust their nibs. I’ve yet to find a single Sailor nib that isn’t perfectly adjusted in terms of ink flow. I’ve never seen a hard start or ink starvation. The only “downside,” if you want to call it that, is that Sailor’s nibs tend to be a little feedback-heavy. Their feedback is usually of the pleasant variety, and many describe it as “pencil-like.” While I can certainly use Sailor’s pens as is, I personally like to smooth them out a bit for a slightly more buttery experience; but I find them so well-adjusted, Sailor’s nibs are among some of the easiest to smooth I’ve ever worked on. They require little more than a few figure eights over a bit of 12,000-grit MicroMesh. Up ’til now, all of my experience with Sailor-made nibs has been in their 14k gold or 21k gold nib lines. I had never had a chance to use a Sailor steel nib, which is what graces Taccia Spectrum. Although branded with Taccia’s logo, the nib is clearly of Sailor manufacture, and that steel nib writes exactly how you might expect from a Sailor pen. 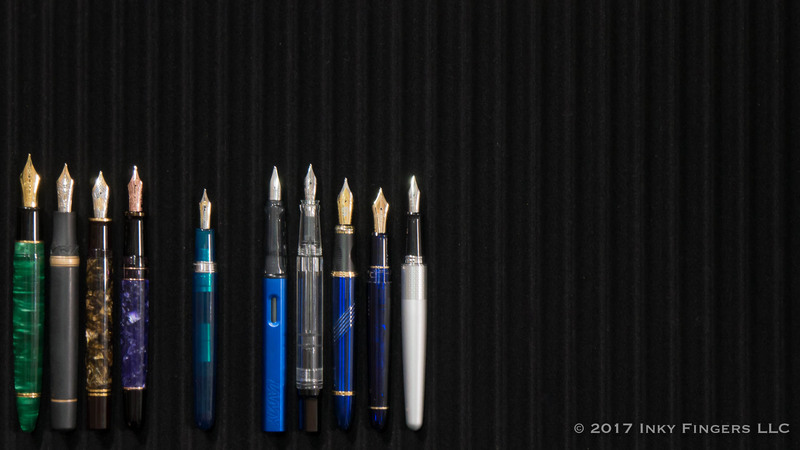 In fact, the writing experience of the Taccia steel nib is so similar to Sailor’s 14k nibs (which are usually quite rigid) that I am not sure I would be able to tell the difference in a blind writing test. 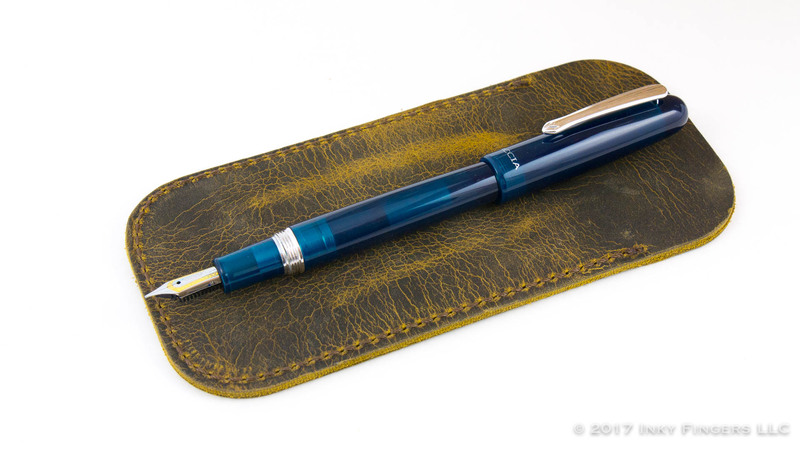 All of that to say that the Taccia Spectrum is a spectacular writer. I would consider it one of the best writers in its price range. I’ve been using the pen for well over a month, and I’ve never had even the slightest hint of any problem at all. Even after leaving the pen sitting on the desk for two weeks, I uncapped it and started writing immediately. Even the miserable Sailor converter has performed well so far. In the hand, this pen is just a hint too small for my personal preferences, especially when unposted. It’s very light, which I light, but the combination of the narrow grip and the shorter length does tend to have a negative impact on my handwriting. 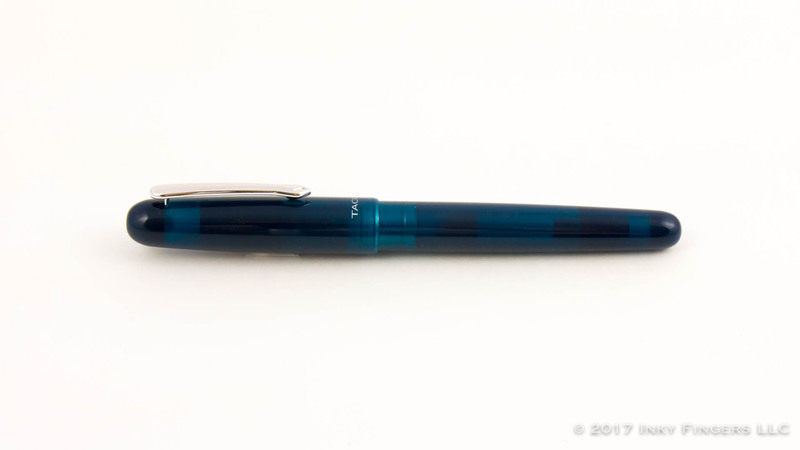 However, it can be posted, and the cap is so light (actually, the entire pen is quite light) that posting makes the pen much more enjoyable for me to use. The Taccia Spectrum is at an interesting price point. 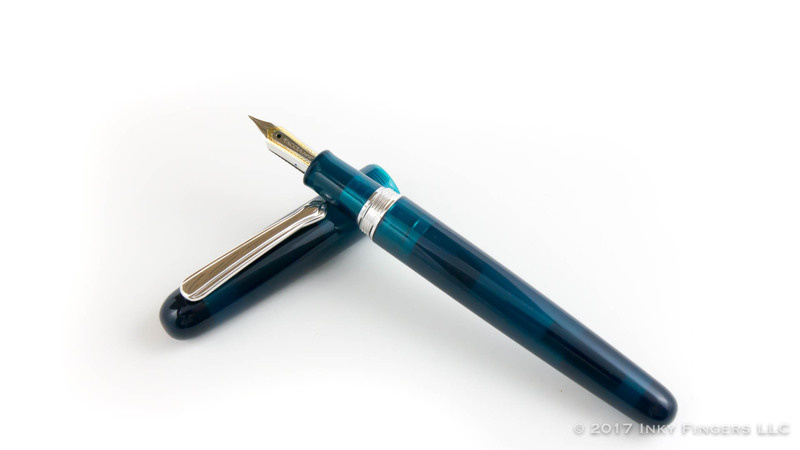 With a list price of $159 for the steel-nibbed version of the pen (they also come in gold-nibbed versions, but I didn’t try those), the Spectrum is priced in the same general range as the likes of the Karas Kustoms Decograph, the Edison production line, and many of Franklin-Christoph’s offerings, all of which offer steel nibs as well at that price point. However, the Spectrum’s street price usually hovers right around $120-$130, which is a much more compelling price, in my opinion. And for a nib that writes as consistently, and as well, as this one? Well, let’s just say that this pen could very easily find itself on my top 5 workhorse pens list next year. In the end, I really, really like this pen. I love that, although they stuck with a standard design, they zhooshed it up by picking some more eye-catching colors. It’s a nice combination of understated workhorse and colorful fashion statement. I like that the writing experience is different than a parade of OEM Bock and Jowo nibs. I like that this pen is dead reliable over and over again. And I like that it’s something a little different than the same few pens I seem to see recommended ad nauseum for people looking to step up beyond the first round of entry-level offerings. 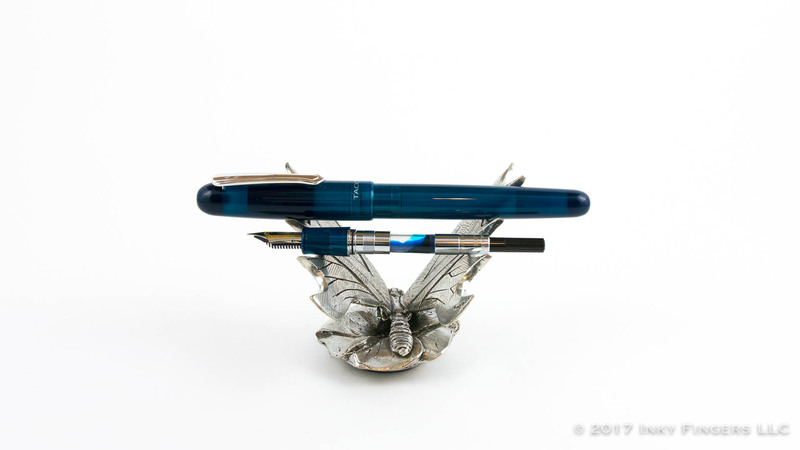 The pen for this review was provided free-of-charge by Vanness Pens in exchange for an honest review and giveaway. 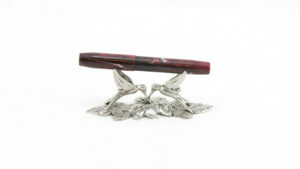 Vanness Pens is a current sponsor of The Pen Habit. All opinions expressed herein are my own.